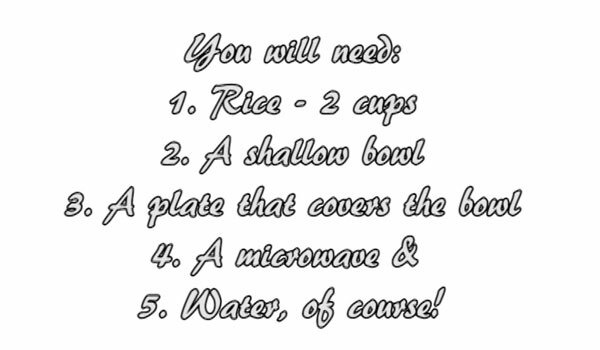 If you have access to a microwave, rice can be made easily by being boiled in an open, shallow bowl.A plate is used to cover it after the microwave is turned off to complete the cooking. First the rice is rinsed several times and then mixed with double the volume of water. Then it is heated in a microwave in a shallow open bowl for twenty (20) minutes. Finally, the bowl is covered with a flat dish to complete the cooking. 1. Measure 2 cups of rice in a shallow open bowl. 2. Rinse it with water, then drain the water. It is up to you, depending upon the source of the rice, whether or not you want to wash multiple times. 3. 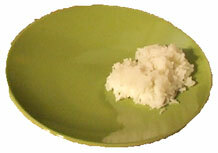 Add four cups of water, as a general rule of thumb, use twice the volume of water as the rice. 4. Put the bowl inside the microwave. 5. Make sure that you do not cover the bowl. 6. Set the microwave for 20 minutes on highest heat setting. Based on our experience a few minutes less or more heating won’t really hurt. 8. As soon twenty minutes of cooking is over, cover the top of the bowl with a plate. This is important because if the bowl is not covered, the top layer of rice will dry out. 9. Leave it covered for a minimum of 5 to 6 minutes. The remaining heat and moisture will cook the rice evenly . The bowl will be hot, so use gloves or kitchen towels to handle. The rice comes out moist and fluffy. 10. Serve the hot rice with your choice of side dishes.